Only through militant struggle can the best in the youth emerge. 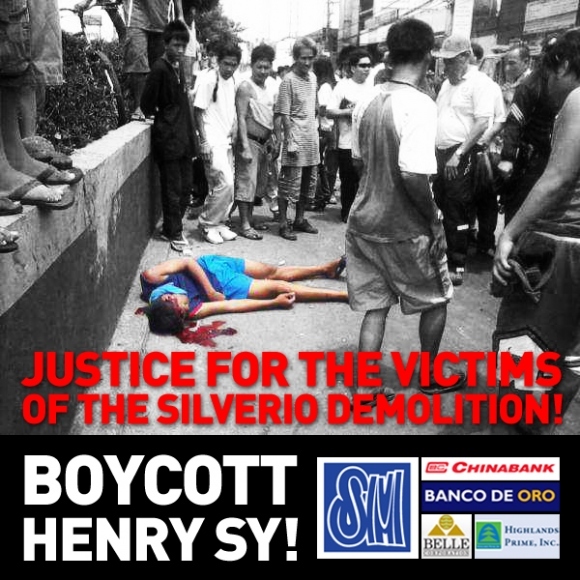 JUSTICE FOR THE VICTIMS OF THE SILVERIO DEMOLITION! Anakbayan chapters throughout the United States most vehemently condemn the violent and brutal dispersal of residents and stall owners of Parañaque’s Silverio compound and the forced eviction and demolition of their community by the combined forces of the Philippine National Police, paid goons, and security agents of business tycoon Henry Sy, on April 23. In their unjustified and unnecessary use of force, tear gas, and gunfire against unarmed civilians, at least one person was killed, 39 were severely injured, and another 30 were illegally arrested. These people were legally defending their homes, small businesses, and livelihoods from destruction. After the “hero’s burial” of Arnel Leonor–killed during the demolition–on April 29, with simultaneous protests throughout the country, President Aquino has yet to say anything about the young man’s death. The Silverio compound, in which 28,000 urban poor reside, is set to be demolished for the establishment of condominiums for the Shoemart (SM) Development Corporation, owned by the Philippines’ richest business tycoon, Henry Sy. Despite the fact that the Parañaque city government had reportedly deposited P10.4 million to acquire the lot and allow the residents to pay for their property through a Community Mortgage Program, state and private business forces instigated the violent dispersal of this community for the continued super-profits of big businesses like that of Sy. This incident is only one manifestation of the ongoing social injustice long suffered by the poor majority of Filipino people. We remember the residents of Corazon de Jesus in San Juan, Metro Manila who were violently evicted from their residences and whose homes were destroyed last year by over 400 police backed by a mob of security agents and a paid demolition team. We remember the Hacienda Luisita Massacre in 2004. The Aquino government’s Public Private Partnership (PPP) Programs legalize the profiteering of big landlords as well as foreign and national big businesses at the expense of the majority of the Filipino people. It creates the basis for the continued rampant demolition of poor Filipinos’ homes and livelihoods, which has become a trademark of the Aquino regime. We condemn this human rights violation, as it represents no departure from President Aquino’s track record on issues affecting the youth. He demonstrates his neglect for public education through his administration’s budget cuts for state universities and colleges, and its recent approval of a new round of tuition and other fee increases for School Year 2012-2013. To the Filipino youth, it has always been clear that his administration treats the masses of Filipino people as second-class citizens in their own country. He readily destroys the future of the youth by abandoning state responsibility to provide access to an affordable education for all, in the same way that his police destroy the homes and livelihoods of the urban poor. He privatizes and commodifies education and, in the same vein, sides with business tycoon Henry Sy in displacing thousands in the Silverio Compound. But what can we expect of a President who happily welcomes US soldiers to trample on the sovereignty of the Filipino people? Since his election to office, Aquino has continued the anti-people policies of his predecessors and has been ever-compliant in selling our lands and resources to foreigners through his PPP programs. Through his puppetry to imperialist nations, especially the United States, his policies are in line with those who have historically worsened conditions in the Philippines. To keep the economy afloat and alleviate unrest, his administration continues the virtual selling of Filipino workers through its Labor Export Policy (LEP), which systematically pushes Filipinos abroad for work. This includes our very own families here in the United States. As Filipino American youth, we recognize that we live in the country that maintains social, political, and economic hegemony over the Philippines. We recognize that the Philippine government’s prioritizes the interests of big and foreign businesses (including many American ones) over those of the Filipino youth and urban poor, thereby forcing our compatriots to leave the country every day in the thousands to find livelihoods abroad. Rather than implementing genuine land reform, promoting national industries, and providing decent jobs within the country for the benefit of the majority of Filipino people, the Aquino government faithfully protects the interests of the few who benefit from the current oppressive system in the Philippines. Furthermore, we condemn the Philippine government’s flagrant use of police brutality and fascist practices in suppressing the justified resistance of the people. We recognize chilling parallels to the fascist current in the US, with the passing of the National Defense Authorization Act (NDAA), Trespass Bill, and the murder of Trayvon Martin. In an effort to resist the Philippine government’s subservience to big and foreign businesses, and to stand in solidarity with the Silverio compound residents defending their lives and livelihoods against state violence, we call on our fellow youth and Filipinos in the U.S. and their families to boycott all businesses owned by Henry Sy, including Banco de Oro and Shoemart (SM). The U.S. has the largest population of Filipinos outside the Philippines, amounting to over four million; our hard-earned money should not fund businesses that kill poor Filipinos in the name of profits. At the Leonor’s burial, Gloria Arellano of Kadamay, an organization of urban poor in the Philippines, stated: “As Leonor is laid to rest today, we call for justice for the victims of the brutality of this state. We promise no let up in this fight. The Filipino masses shall soon be able to end this oppressive government and its anti-poor and fascist policies.” We stand in solidarity with the urban poor in demanding justice for the victims of the “Silverio Massacre.” We shall continue the fight for Philippine national democracy and justice against state violence both in the Philippines and the U.S. BOYCOTT BANCO DE ORO AND SM! CONTINUE THE STRUGGLE FOR NATIONAL DEMOCRACY! ← MAKIBAKA! HUWAG MATAKOT! Unite and Strengthen the Filipino Youth Movement in the U.S. to Advance the Struggle for National Democracy in the Philippines! We Invite You to N30: 11 Years of Fighting for Just & Lasting Peace! Water is Life! Land is Life! Anakbayan New Jersey Supports the Standing Sioux Nation!